Hours after former president Olusegun Obasanjo issued a "state of the nation" address attacking the Buhari administration, the presidency issued three words in reply: "Get well soon." 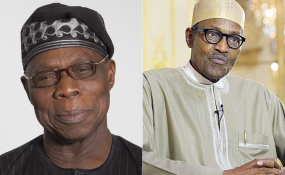 The Obasanjo address accused President Muhammadu Buhari of plots to rig the general elections in February and running a presidency similar to that of late Sani Abacha. Presidential spokesperson Garba Shehu issued a statement called the six-page address of Obasanjo "a last push by desperate politicians who can't handle the President politically and have resorted to subterfuge." "Our first message to the former President is that he needs a good doctor for good treatment and to say to him, "Get well soon." "As repeatedly said of him, since Chief Obasanjo left office in 1979, he never let every succeeding leader of the country function freely, and this included the one he personally handpicked against all known rules drawn up by the party that put him in the office of the President," he said. He said Obasanjo was jealous because President Buhari has more esteem than him, saying, "the sooner he learns to respect him the better." "It is a notorious fact that in dealing with any leader that he failed to control, he resorted to these puerile attacks. As the grand patron, more correctly the grandfather of corruption as described by the National Assembly, Chief Obasanjo released [Sunday's] letter purely for the reason of rescuing his thriving corruption establishment." He assured that the elections starting in February will be free and fair as promised the nation and the international community by President Buhari. "What Chief Obasanjo and his co-travelers in the PDP should expect is that from the outcome, we will teach them a political lesson that they will never forget. This margin will be much bigger than we had in 2015.
" Claims that President Buhari and the All Progressives Congress (APC) have embarked on the president's "self- succession project, by recruiting collation officers who are already awarding results based on their projects to actualise the perpetuation agenda, in which the people will not matter and the votes will not count" is not only utterly false, but a copious note from the book on the failed third term agenda of President Obasanjo.
" The man, President Buhari who has taken Nigeria's reputation to a higher level internationally and is working hard to improve on the records of elections he found in place cannot descend to the level that Obasanjo has himself sunk," he said. On corruption, he said, " as for his attacks of the administration's records in fighting corruption, what the former President said is no more than evidence that President Buhari's war against corruption is succeeding. They thought it is all a joke. "A leader who took USD 16 billion "upfront" to supply electric power yet failed to add a single megawatt to the national grid and to date, there is no trace of the money is jittery that he will be called to account. He is a coward. "Chief Obasanjo, manifesting a confused state of mind blames President Buhari for the fall of Libya into a failed state and the unholy alliance between the Boko Haram terrorists and the ISIS, while at the same time calling it an African problem, saying "the struggle must be for all West African, Central African, North African and most East African States," which really does not amount to saying anything new. "Nigerians looked up to him as a role model and a ray of hope to ethical and clean leadership until President Yar'Adua called him out to explain what happened to the sixteen billion dollars of taxpayer's money. It is clear that with him sitting on top of the heap of corruption, he is no different from the crowd he leads. "This language of his 16-page letter, likening President Buhari to General Sani Abacha, a man he dreaded and the one who jailed him under military laws is most unfitting from a former President of Nigeria." The presidency faulted the claim that President Buhari has put in place rigging machinery and described it as both outlandish and outrageous.
" We are unable to get the words to describe a 90-year old liar, except to say that by the publication of this tissue of lies against the President, he Obasanjo, not the President will fall from everyone's esteem," he said.